Seeds of Coriander: A side of Metallica with my popcorn chicken, please. A side of Metallica with my popcorn chicken, please. I was driving up the freeway, munching on spicy basil popcorn chicken and Thai milk boba tea, when "Enter Sandman" starts playing on the radio. Naturally, windows went down, and the volume went up. I rocked out to old school Metallica like nobody's business (and probably to other drivers' amusement) the entire time that song was playing. And it turned into a moment. Where all of a sudden, life is in perfect clarity, and you're all "have I even been in my own body lately?" Then, "Push It" came on the radio and, of course, I rocked to that, too. Which probably horrified the little old lady driving next to me. 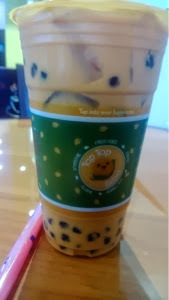 Silly advertisement here: If you live in San Diego, go check out Tap Tap Boba on Telegraph Canyon Road in Chula Vista. They have a website at http://www.taptapboba.com and if I can figure out how to put that as a link on this new iPad, I will do so. The popcorn chicken is delicious, and will make you do puppy dog eyes at the empty bag. Their cappuccino smoothie is amazing, as is the Thai milk tea. I added boba to mine because squishy, yo.